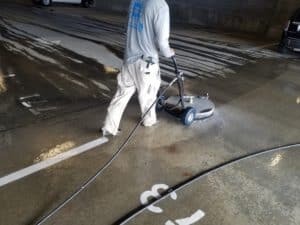 Concrete cleaning with a surface cleaner - Pro Wash LLC. 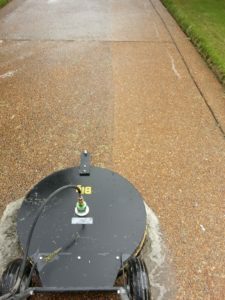 It is safe to say the tool of choice for professional pressure washing companies is a rotary surface cleaner. These tools give many advantages over cleaning concrete with a wand. For starters, when using a wand, it is swung in an arc. The part of this arc closest to the ground will be cleaner while the outer sections of the arc will be less clean. The big problem is, it is hard to tell this when the surface is wet. Once it dries it becomes very noticeable. Speed is another advantage. Surface cleaners can give an increase of 50% in terms of speed, efficiency and productivity. Before we go over how they operate, lets take a look at the 5 main components of a surface cleaner. Deck or housing– This is basically the body of the surface cleaner. It is where the wheels and brushes attach. It encompasses the spray bar and keeps water, rocks and a wildly spinning spray bar safe and contained. Typically made of aluminum or plastic. Spray bar– A steel or aluminum bar with spray nozzles installed on the ends. The spray nozzles are angled, which creates the propulsion needed to rotate the bar at high speeds. The bar is attached to the swivel, which is attached to the deck/housing. Swivel– This piece bolts onto the deck or housing and allows the spray bar to rotate while high pressure water is pumped through it. It is supplied at the top with a high pressure hose while the bottom has a fitting that the rotating spray bar screws onto. The swivel is one of the most expensive and important parts of a surface cleaner. Trigger- The trigger lets the user start and stop the flow of water to the swivel with the squeeze of a hand. Not unlike a standard wand configuration. Nozzles- Although one of the smallest and least expensive parts, the nozzles play a huge roll in successful results. Spray nozzles must be matched to the pressure washers output specifications. They are wear items, similar to brake pads on a car. Let’s say a surface cleaner has 2 25° nozzles installed. The spray pattern of the water coming out of each nozzle would be in a “V” shape. After many hours of use, more water may be coming out of the right side of the “V” than the left. This is due to the erosion properties of high pressure water. Yes, it will even eat away at high grade stainless steel over time. This can cause striping on cleaned surfaces, vibrations and a general “patchy” look. 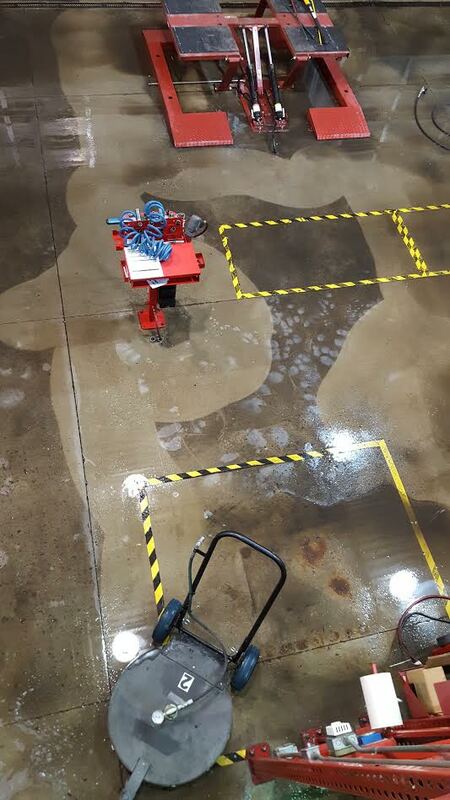 The easiest way to understand the workings of a surface cleaner is to follow the water along on its journey from the the garden hose to the concrete. Water is brought to the pressure washer at roughly 60 psi, where it is converted to +- 3000 psi. From the pressure washer it will go through the high pressure hose which is plugged into a surface cleaner. Upon squeezing the trigger on the surface cleaner, water flows through yet another short high pressure hose that supplies the water to the swivel. After the water leaves the swivel, it goes into the spray bar and out through the spray nozzles. This is where the streams of water clean the surface, and since the nozzles are installed on a slight angle on the spray bar, creates the propulsion needed to rotate the bar at high speed. This is a simple breakdown of the machines. There are dozens of styles and sizes to choose from. Our top choice for non vacuum reclaim cleaning is Whisper Wash. Any time we need to use our vacuum system, Sirocco is our “go to”. Techniques vary depending on the surface in need of cleaning. Pro Wash has an arsenal of these deep cleaning machines ready to provide Nashville customers with sparkling clean concrete. From 40″ vacuum reclaim units to 12″ units designed for stairs, we have you covered. As always, feel free to reach out to us if you have any questions about any pressure washing process. We are here to help!